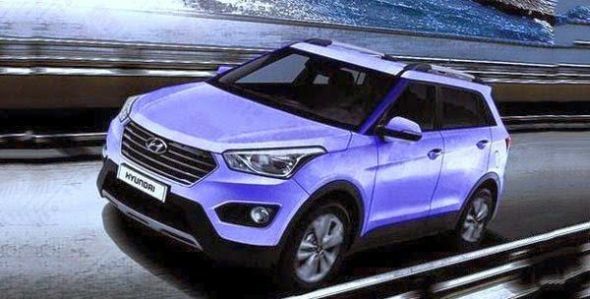 India-bound 2015 Hyundai iX25 compact SUV leaked? Hyundai has been readying up the iX25 compact SUV for an official unveil at the upcoming Beijing Motor Show, which will commence from the 20th of April. As is with the case of innumerable leaks that we’ve been witness to, especially ahead of a major motor show, a solitary image said to be that of the 2015 Hyundai iX25 compact SUV has leaked to the interweb. Italian motoring website JokeForBlog has uploaded an image of the hotly anticipated compact SUV. 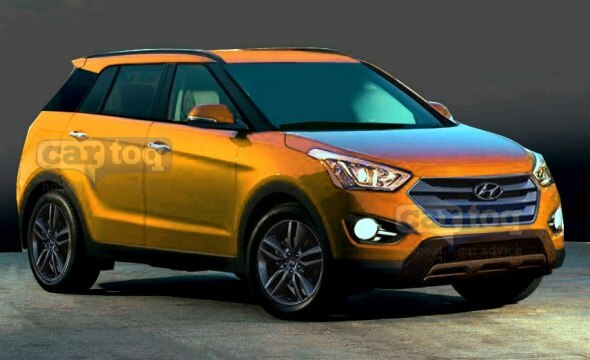 Interestingly, the leaked image of the iX25 is very similar to CarToq’s the in-house render of the compact SUV. Design wise, the iX25 is a baby Santa Fe, and follows the latter’s Storm Edge design, a variation of Hyundai’s Fluidic design theme. The first compact SUV for Hyundai to go against the likes of the Renault Duster and the Ford EcoSport, the iX25 is a very important product considering the big growth and sales potential of the segment it seeks to enter. The iX25 will be based on the 2015 i20 hatchback platform. Notably, the all-new 2015 i20 hatchback will make an appearance later this year, at the Paris Motor Show. In that sense, the iX25 is the first product based on the new i20 platform. The iX25 will be more than 4 meters in length and will seat five adults. The compact SUV will be sold with petrol and turbo diesel engines. Both manual and automatic gearboxes are likely to be offered. While lower priced versions of the iX25 will be front wheel driven and with a torsion beam suspension set up at the rear, the top end models of the SUV are likely to be made available with independent rear suspension and an all wheel drive layout. The Hyundai iX25 compact SUV will make its Indian debut next year. Click here to read more.